Before I announce the July Scraptastic Tuesday winners, I have some progress to share. These are my blocks from BeeSewcial - I asked for all the colours with a 'maximalist' improv theme. These blocks are a riot of colour and pattern and one cannot help but smile at them, even when looking at this late night, bad light photo. I arranged and rearranged them, left them up and took them all down from my portable design walls and put them up again. Maximalist is so outside of my comfort zone, despite how much I love these blocks. Finally I settled on this arrangement and started piecing them together. the two columns on the right are joined now as columns but not together yet, and a couple of the blocks at the top are joined. 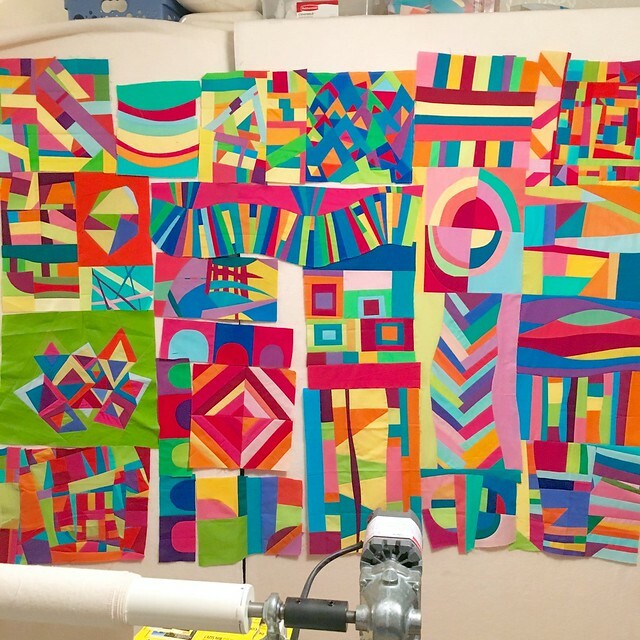 There are no directions for how to make this kind of quilt and to make it 'feel right'. I did have some intention to this layout. It is sort of a medallion style, with the circles and diamond blocks sort of balanced. The corners are each crazy quilt style improv blocks and in between there is the roughest bit of working from the centre out. And there is no real hot or cool spots of any size. Now can you see it? Anyway it makes sense to me. Of course the blocks are irregular which means adding fabrics to make them fit. I am trying not to change the blocks much as I go which means adding scraps of fabrics to the curved bits, etc. It is slow work as I am audition colours and such but it is also fun. I will share again as I go. 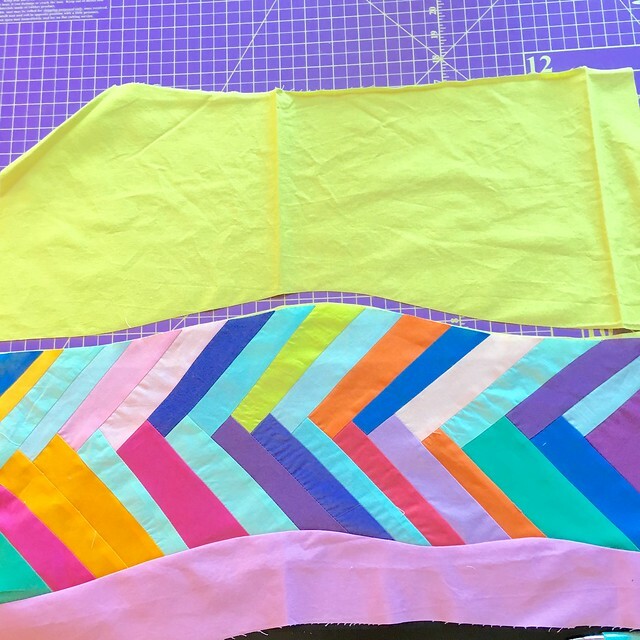 Please join Nicky from Mrs. Sew and Sow and I next month to link up your scrappy project or thoughts on taming your scrap mountain on the second Tuesday - July 13. And if you are looking for some scrappy inspiration, visit the July links, they are awesome. This quilt took my breath away - I mean I gasped when I saw it. I can't wait for you to put it together. Wow - you've got a beauty here. Throw your comfort-zone aside and have fun! yes, I see it! Looking so good and SO maximalist! Wow! Now THAT is modern! Nothing traditional about that at all. I absolutely love it. The colors are breathtaking. It's a winner, Leanne! This is just amazing!! Such a riot of colour but it works so well. Look forward to seeing how you get it all together. Striking ! I can't wait to see all these blocks joined together. A dazzling rainbow.You are very creative and can't waiit to see it finished. Congratulations to all the winners and thanks you,I am overjoyed for be one of the winners. So much to look at! Looking good! Your blocks are amazing--I love how they look altogether--so fun! I will have to change all my preconceived ideas about you Leanne seeing this maximalist version of you! Teehee! It is good to do something very different once in a while. Enjoy the challenge! It takes my breath away; absolutely gorgeous! Amazing! And quite a challenge in getting to all together, looking forward to seeing it finished. I wonder, are you tempted to add some 'filler' strips/borders or maybe a bit of b&w? P.S. Your quilt is stunning! FAL Q2 - Finishes Link is Open! Scraptastic Tuesday - the June Link is open!